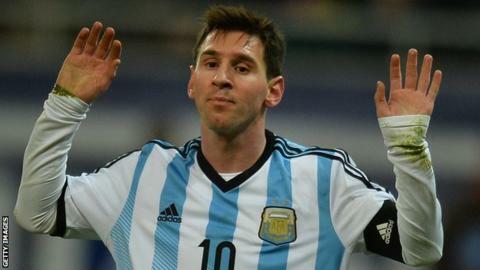 Former Argentina player Ossie Ardiles says Lionel Messi would swap his club success for a World Cup winners' medal. Messi, 26, has won 21 club prizes with Barcelona but has not passed the quarter-finals in two World Cups. "He would give all the medals he has won at Barcelona to win one World Cup," said 1978 World Cup-winner Ardiles. "To be considered alongside the top, top guys like Pele and Diego Maradona and so on, he not only needs to be in the World Cup but to win it." Messi won the World Youth Cup in 2005 and gold at the 2008 Olympics with Argentina, but was mostly used as a substitute in the 2006 World Cup and was part of the side beaten 4-0 by Germany at the last-eight stage of the 2010 tournament. No European team has ever won a World Cup held in South America, but former Swindon, Newcastle and Tottenham manager Ardiles feels the global nature of club football means that international players no longer struggle to adapt to tournaments on different continents. "Three or four teams from Europe have a big chance in Brazil," said the 61-year-old. "Though Brazil are playing at home, being at home is not a big advantage anymore. "Players play all over, things have changed. It is a lot less [an advantage] than it used to be."